Shares in troubled smartphone maker BlackBerry have plunged to their lowest in a decade after the Canadian company failed to find a buyer. BlackBerry's shares fell 17% on Monday evening to $6.43 on the Nasdaq after the company scrapped a $4.7 billion rescue bid from Fairfax Financial Holdings (FFH), its largest individual shareholder. It will instead receive $1 billion investment from FFH and a group consisting of "Other Institutional Investors". The investment, which has a seven-year term, is a loan that can be converted into BlackBerry common stock at $10 per share down the line. According to a report by news agency Reuters, BlackBerry had been in talks with several companies including Cisco, Google, SAP, Lenovo, Samsung and Intel about selling parts or all of its units. Remaining public could dent BlackBerry's chances of a turnaround, according to analysts. Ovum Chief Telecoms analyst Jan Dawson said: "Fairfax's investment will buy the company some time, which it badly needs, but the company needs a new strategy more than ever. "If Fairfax had taken the company private, it could have kept that strategy to itself. But with BlackBerry remaining a public company, Chen and Fairfax Chairman and CEO Prem Watsa need to start communicating that new strategy very soon to inspire confidence in a turnaround." 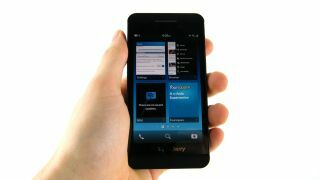 BlackBerry has also announced a change in leadership, with CEO Thorsten Heins leaving the company. John S Chen, who is taking over as executive chairman and will act as interim CEO, was formerly at the helm of software and services company Sybase, which was acquired by applications giant SAP in May 2010 for $5.8 billion. The smartphone maker was name Canada's most valuable company in 2008 with a market value of $83 billion and peaked in 2011, shipping 51.5 million handsets, according to analyst house Gartner. That fell to 32.5 million in 2012 and is expected to drop to 23 million in 2013.